Thirty days hath November. It also hath a fair bit of rain but that is generally a welcome change after a warm fall. The red poison oak has been reduced to sticks while the leaves on the vineyards and sycamore trees cling on until later in the month. By the end of November there is green grass slowly transforming the hills from golden to verdant. The mornings become cold and my honey bees are hunkering down in a big ball of bees in the center of the hive. When the temp gets above 57F they will fly about, otherwise they gorge themselves on honey and snack on pollen. (Decided to leave all their honey this year as I am splitting the hives in the spring). So have a glass of wine and watch the bees go to and fro! Anyway, I digress....Let's see what is going on, always remembering that the best things in life are not events or things. ​Occidental Center for the Arts: Nov 10, 8-10pm. Gypsy Jazz!!! I have always considered bluegrass to be the most complicated acoustic music but Gypsy Jazz takes it up a notch. Anyone who claims to play this genre is very talented. I would see this group for sure if I was up there!!! Occidental Center for the Arts: November 11, 730P: A german trio of violin, piano and cello. Hey, they played at Carnegie Hall and now they are scheduled in Occidental!! Thats the really cool thing about the small groups...they are willing to play at small venues. Sounds like a great evening. Dinner in Occidental then walk from the restaurant to the music venue literally 150 yards down the street and five minutes from the house!!! Occidental Center for the Arts: November 18, 8-10: Celtic harp by a true virtuoso! Transport yourself to the Irish countryside as Patrick Ball spins tales and paints a picture with his harp. Like Nike says, just do it. ​Howard Station: Yes, it is a culinary event! My hands down favorite breakfast spot. (It's cash only but there is an ATM.) You really should stop by there for breakfast. Occidental is a beautiful town and this place is a piece of history. Take a stroll through the old grove of trees (things to do tab) after breakfast! Well, that should get you started. There are plenty of wineries, other great places to eat, road trips to take, hikes to enjoy etc all in my "things to do" or "outlying areas" tab. Or you could sit next to a bee hive and watch the bees. But if you do, sit about ten feet away as the little guard bees will poke their heads out and put the bead on ya! October begins like summer and typically ends looking a lot like winter. One day the forests are ablaze with fall color and the next day the winds and rain transform the scene to that of early winter. Time to get out those fall clothes you have been waiting for! The smell of newly wet bay leaves makes an after rain hike all the more special. If you read my archived blog posts you will see that there really isn't a month that doesn't have some merit. The spring and fall and summer months are chip shots, but the fall has that slower vibe that contrasts with the faster paced summer months. The rainy months can be a great time to go hiking as you will likely not see a soul and there is something about a redwood forest in the rain....primeval! I do have a bias toward outdoor activities so if you don't like to get dirty...my apologies. There are plenty of wineries to visit and cool towns and restaurants to visit to keep anyone happy. Lets take a look! 10/23 update: The fires affecting Santa Rosa did not involve western Sonoma County. So it's business as usual here while unfortunately Santa Rosa was heavily impacted and many people lost their homes. We have seen one heavy rain here and there will be more to come as November approaches so the fire season is pretty much over. Occidental Center for the Arts: Celtic harps! Oct 14, 8-10 pm. Five minutes from the house! Occidental Center for the Arts: October 21st Brazilian Jazz! ​Hopmonk Tavern Sebastopol: Here is the live music line up. Have a brew, chill. ​Bodega Bay Calendar: That's right. It's empty! Good reason to visit Bodega Bay!! My my but summer just flew by didn't it? Here it is September which is a fantastic month in west Sonoma County. The maple trees are already turning yellow soon to be followed by the vineyards and willows....love it! Sorry to let my fan base down since June....Bob...are you still there? Anyway, Bob will get over it. Time to get on with the fall and see what it has to offer us! ​Occidental Center for the Arts: Simrit, Sunday, September 24th at 730 PM. This sounds interesting! It also sounds very Occidental. Check it out! Occidental Center for the Arts: African rhythm music September 30th. Interesting. Get in the groove! ​Hop Monk Sebastopol: Here is the musical lineup. Have a brew and chill! ​The Barlow: Cool place to walk around, have lunch, see what's going on. Hiking: There are many good places to stroll through the woods this time of year. Take Coleman Valley Road uphill from Occidental and Take a right on Willow Creek road. Go to the end of the road and park at the gate. Walk down willow creek road. Take a left on a trail called Jamboree. It's an out and back along the ridge but super pretty. Don't hike on the private property to the right and left as you go down Willow Creek until you get to the state park property. You can hike all the way down to the creek which is super pretty but a bit of a slog on the way back. Also the Old Grove of Trees mentioned in my "things to do" tab is a total winner as is the Kortum Trail out at the coast in the fall. Red hill is another great hike. Follow my directions on the things to do tab to the other end of Willow Creek road at Bridgehaven. The road going up the creek is a bit rough. Try to make it Pomo Campground. 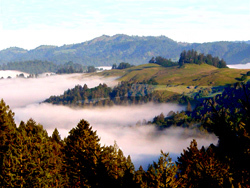 Hike up through the woods to red hill where there is a great view of the ocean and the mouth of the Russian river. This is an out and back with a loop for part of it. You can also access Red Hill from the trail that is across hwy 1 from Shell beach. January in Sono ma County is the prelude to spring! We have had about 30 inches of rain so far this season without losing power or getting out the chainsaw. The rain has come in increments....frequent increments...so there has been no drama. All the creeks and seasonal drainages are gurgling nicely and the hills are green with what promises to be quite the crop of grass. The wild currants are blooming, the wild iris is blooming, and the mustard grass will soon turn the vineyards ablaze in yellow. This is a quiet time of year with few tourists. The coastline and hiking areas are very quiet and the scenery is spectacular! The boys and I took a hike up through Pomo camp around ﻿﻿Red Hill﻿ ﻿at the end of Willow Creek road and were treated with great views and perfect weather. Ask me about that hike it you are interested. So let's take a look at any events that may be happening as well as outdoor activites you may enjoy, remembering as always that the best things in life aren't things.